The beautiful 3 pieces set of wooden nesting doll is hand crafted by the Russian artist from the town Sergiev Posad (old center of folk crafts). 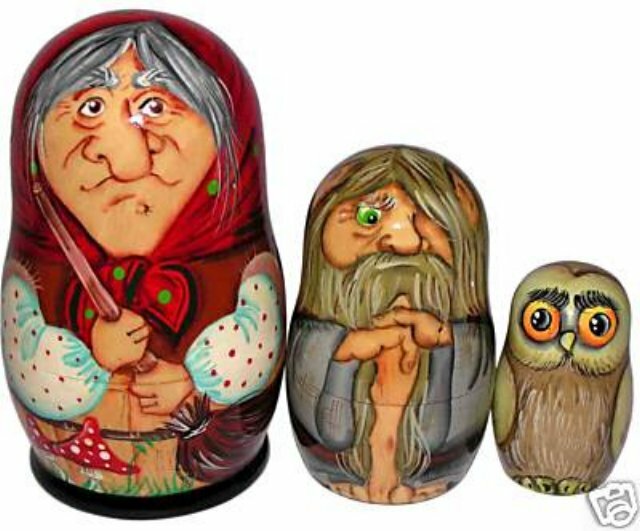 It’s a Baba Yaga’s family – featuring the witch Baba Yaga, the water spirit Vodyanoy and the forest spirit Leshii who is often depicted as an owl. Great artwork on this unusual set - the biggest doll is 5.2 inches tall.